Have you ever bought or borrowed a book, either because it looked interesting, or because a friend recommended it, and then found that you’ve actually read it before? That happened to me recently. I was exchanging emails and blog comments with my friend Becca, because I’d mentioned that one of my favorite books to re-read was Bread Alone. 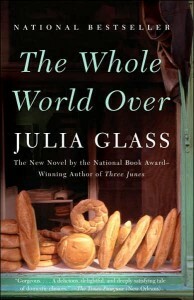 She suggested I might like The Whole World Over, by Julia Glass. Later that weekend, I bought a copy at the local used bookstore, in hardcover, for under $5. That evening in the bubble bath, I cracked open the book, only to find the opening pages eerily familiar. Sure, there’d been a sense of deja vu when I’d looked at the cover in the store, but I’d just assumed I’d seen similar cover art. Nevertheless, I began reading the book anew. And the thing is, I don’t mind this sort of rediscovery. I remember that I’d enjoyed the book the first time I’d read it, but I read very quickly, so there are times when, depending on my mood in the moment, certain things catch my attention differently. Example: When I was little, and read Little Women for the first time, the part that I cried through was when Beth died. When I read it again as a young adult, who’d had some experience with love and relationships, I was moved by the scene where Jo refuses Laurie, because on one level, we want these two brash kids to be together, but anyone who’s had a best friend of the opposite gender knows that those relationships never work when they cross into romance. The Whole World Over, then, is going to remain my “bathtub book” for the next couple of weeks. I know the story well enough that I don’t need to race through it to see what happens, but that doesn’t mean I won’t appreciate a slow, savoring read of it while I soak in lavender-scented bath bubbles. What about you? Do you ever “re-discover” a book? Do you embrace the situation, or feel cheated out of a new story?